In Ogawara-machi, which is 35 minutes from Sendai on the Tohoku Honsen (570 yen each way, 1140 round trip), you will find all manner of stuff to see and do. We have the Forte mall, which is accessible on foot (30-40 min from the station), by cab (5-10), and by bus (10-30 min. depending on how long you have to wait). At Forte you'll find bowling, arcades, a major grocery store and bakery with decent supplies of western food (including taco and chili mixes, Italian pastas, etc. ), an Indian restaurant, and all the Japanese fashion outlets you can shake your gaijin head at. Plus lots of other stores, the World Buffet restaurant, which is quite nice, and it is just across the way from Haneko Arena, the local gym with sports and martial arts classes, etc. and Ezuko Hall, which hosts various cultural events and ceremonies, concerts, plays, etc. The area also has a Mcdonald's, pachinko, and a home goods store. Ogawara also lies on Route 4, the major non-expressway thoroughfare connecting Tokyo with Tohoku, and as such boasts a number of restaurants and other stores. Among them is Blu-Sta, a great charcoal grilled yakinuki restaurant (go early, it fills up fast), Kappa, your typical kaiten sushi place, a bunch of other restaurants that smell really good, a Miyagi coop grocery store (much farther from the station, in Kanagase). And in the vicinity of the Coop, a D2 do-it-yourself store, a curry house, Uni-Qlo and other stores for gifts and clothing. Rte. 4 also boasts three separate electronics stores in Ogawara, a brand new Yamada denki with everything you might need without the hassle of going to Sendai, as well as a Super Denkodo and Dengenkisoko that are older and smaller, but possibly cheaper. And of course, various book stores, video rental places and recycle shops line the road as well. Ogawara is also home to the Senbonzakura, or 1000 cherry blossom trees in a single glance. 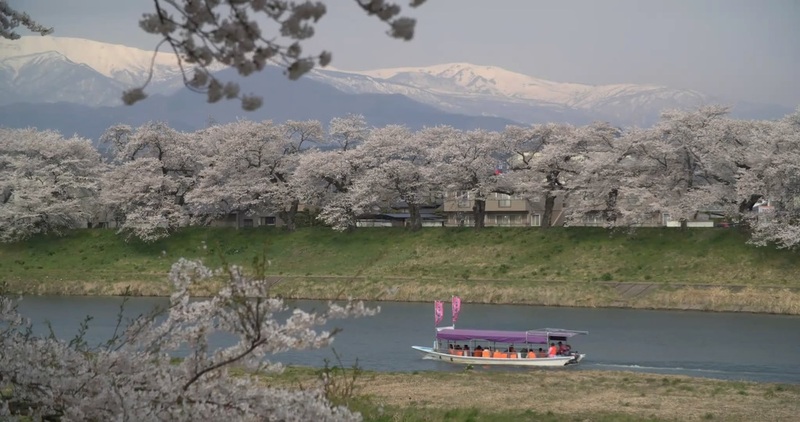 There are over 1,100 cherry trees lining both banks of the Shiroishi River, allowing for some simply awesome hanami quite close to home. Ogawara is a fairly compact and flat town, making bicycle transport the cheapest and most convenient. Walking is also quite easy if you've got a spare 15-30 minutes. You can drive, but I prefer to save my cash. There are buses from the station to the mall and on to other towns, but otherwise no public transportation in the town.